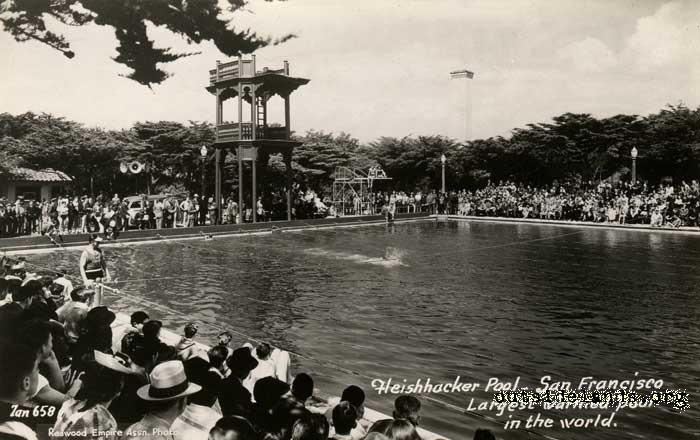 Fleishhacker Pool, the "world's largest swimming tank" officially opened April 23, 1925. Every time we went to the zoo in the early 1970s my mother would point: "That's where Fleishhacker Pool is. Salty and cold with a great big diving tower." We'd peer through the chain-link fence at the pool—a huge pit full of greenish rainwater—and at the rusty diving platform facing it. One of mom's childhood triumphs had been jumping off that tower in front of her older siblings. Over the years I've tried to inspire my daughter with tales of the pool: "There used to be a huge swimming pool here, biggest outdoor pool in the world!" 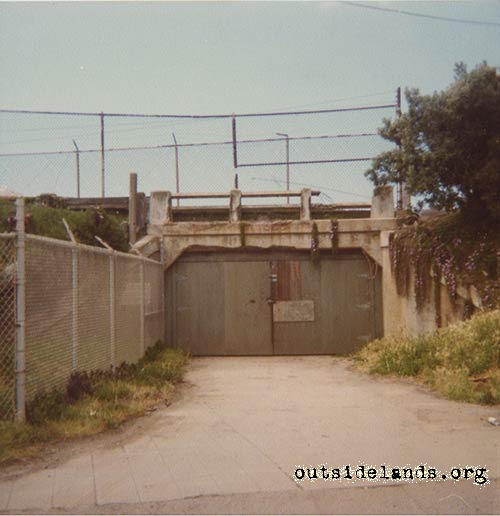 But the tower's gone, the pool site is an unglamorous parking lot for the San Francisco Zoo, and the hulking bathhouse is boarded up and decaying. She's weary of hearing about it. "I know, Dad, I know. Big pool." The "world's largest swimming tank" officially opened April 23, 1925. 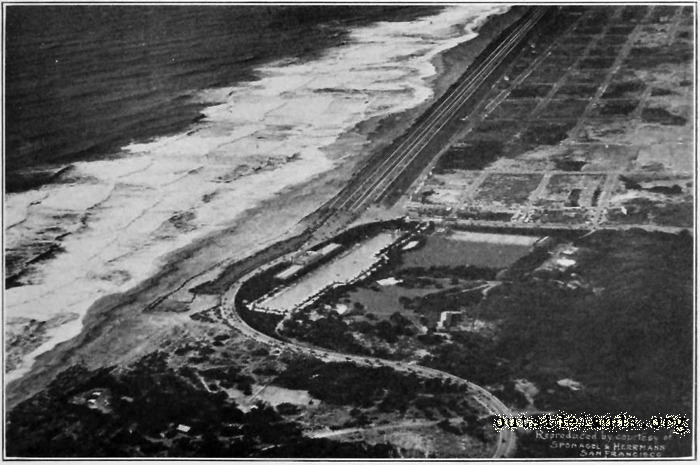 San Francisco had acquired sixty acres at the beach south of Sloat Boulevard from the Spring Valley Water Company in 1922. Park Commission president Herbert Fleishhacker spearheaded the purchase of the land and the vision for a massive recreation center with a giant pool, play fields, and a zoo. Fleishhacker and his brother Mortimer donated $50,000 to construct a Mother's Building on the site in memory of their mother, and Mayor James Rolph introduced a resolution to name the entire park after the Fleishhackers. 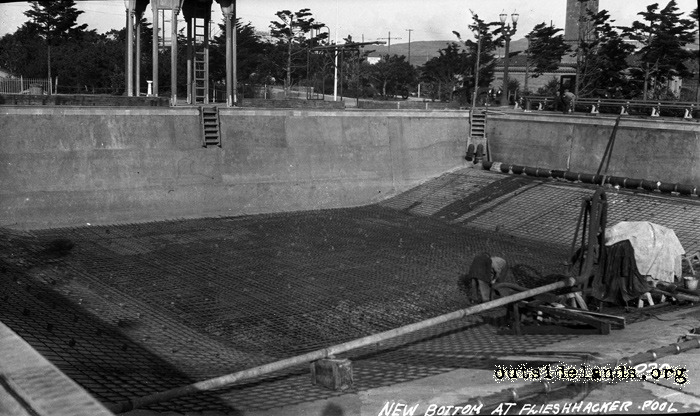 Construction began on Fleishhacker Pool in the spring of 1923. 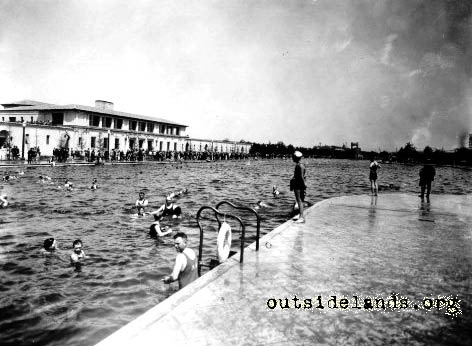 Engineer Earl Clements prepared the plans for the pool, while the firm of Ward & Blohme designed the playground structures and the massive bathhouse that still stands today. 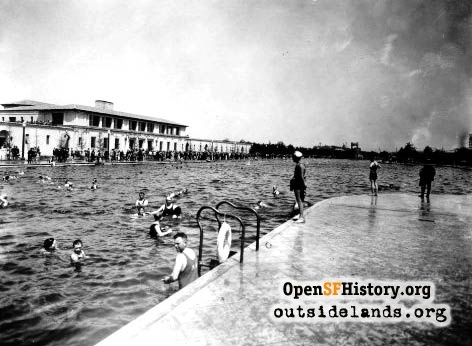 The pool and bathhouse facilities cost San Francisco a little over a million dollars to build, but the city received a lot of swimming space for the money. 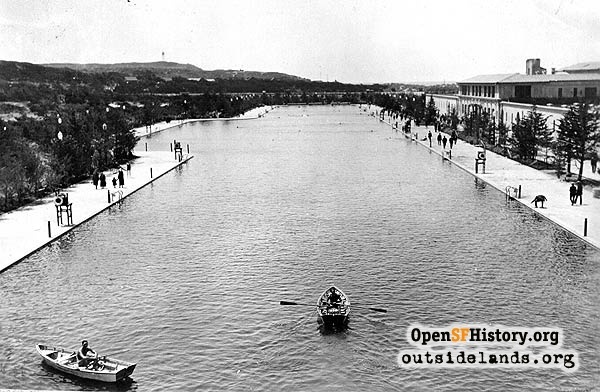 Fleishhacker Pool was a thousand feet long and 150 feet wide, billed as the world's largest. Filled with six million gallons of seawater, it had to be patrolled by twelve to twenty-four lifeguards, some in rowboats. Supposedly heated to seventy degrees by a boiler system, everyone who remembers the pool speaks of the cold. The chilly waters from the Pacific Ocean and the frequent summer fogs made for an invigorating swim. Still, the cold didn't keep the people away in the 1920s and 1930s. 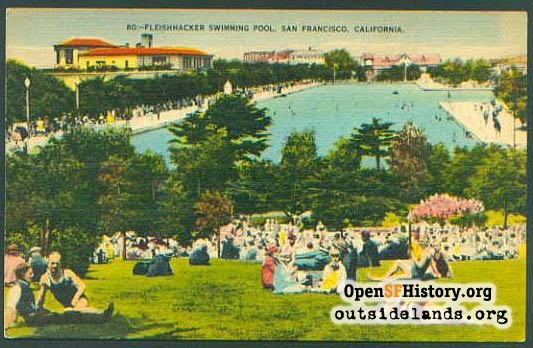 In the first two months after Fleishhacker Pool opened, almost 60,000 people jumped in. 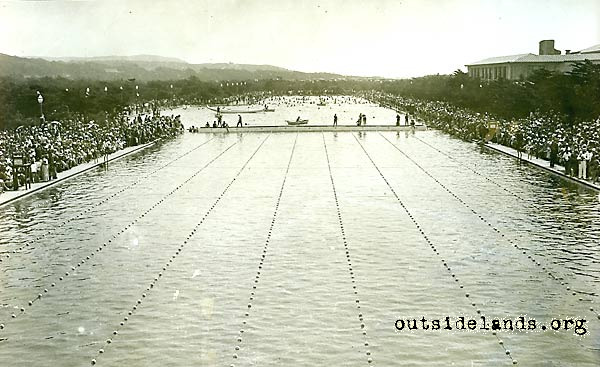 The pool hosted major diving and swimming competitions, including Olympic trials. Medal-winning swimmer Ann Curtis set world records in the salt water. 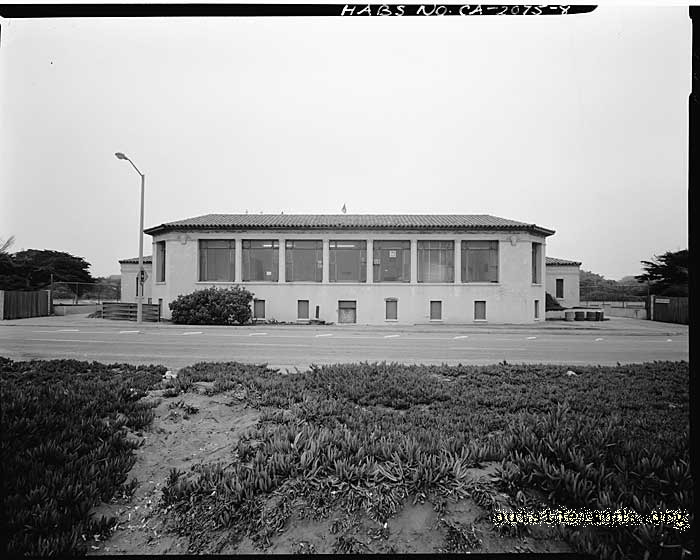 Between the pool and the untamed Pacific Ocean stood the enormous Mediterranean style bathhouse with its green glazed tile roof. Inside were lockers and changing rooms for up to 800 swimmers, ocean-facing dining rooms on the top floor, and a mini-hospital to care for slips and falls. 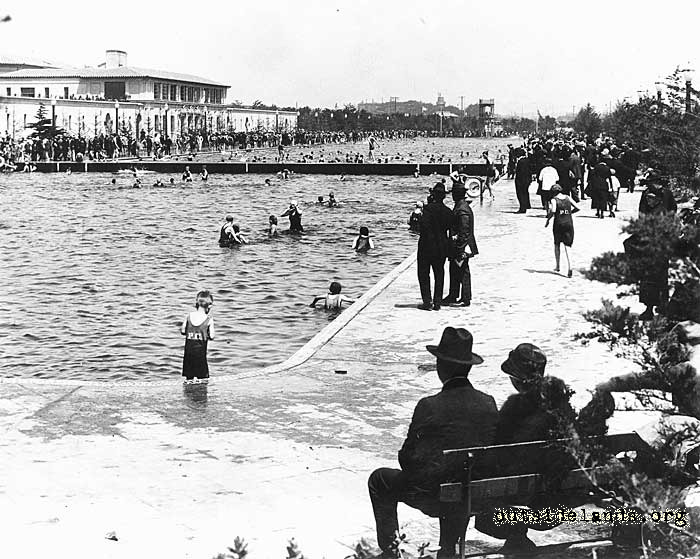 Fleishhacker Pool, for all its magnificence, never really paid for itself. Maintenance costs started high and just got worse as the infrastructure aged. 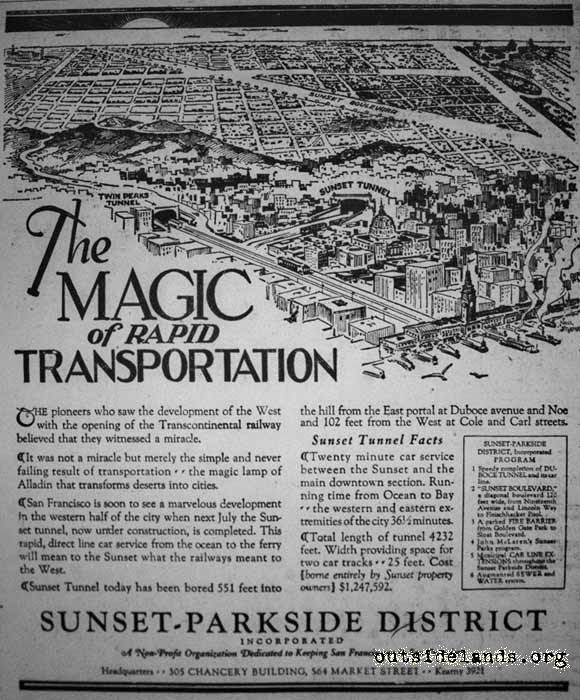 The rise of automobiles meant more families could leave the city for recreation, and the west side of San Francisco didn't get any warmer. 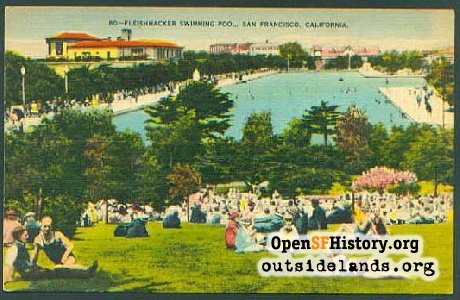 As early as the 1940s plans arose to turn the pool into an ice skating rink (a fate to which Sutro Baths up the road succumbed). Newspaper editorials called the installation a white elephant as business dwindled in the 1950s. 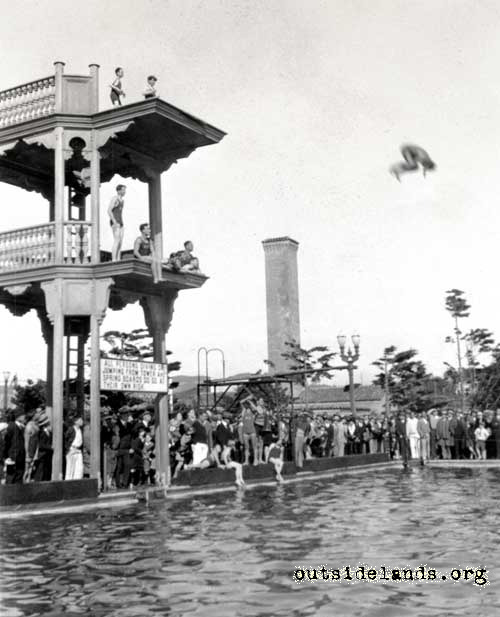 Still, the pool held on and my mother had her chance to leap off the diving platform. 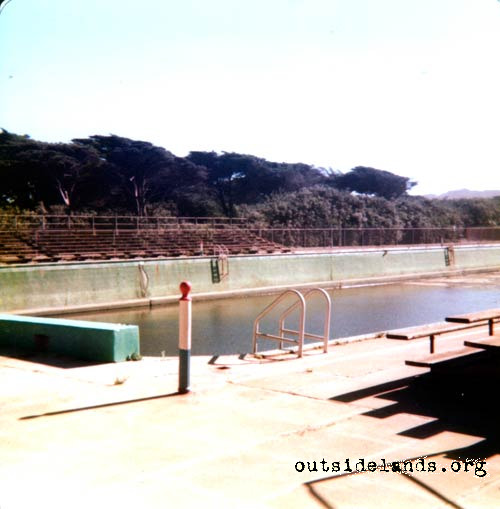 In January 1971, a storm damaged the outflow pipe to the ocean and the pool's water became contaminated. The city tried to use fresh water for the first time, but immediately had an algae problem. The San Francisco Zoo, which had grown to become the primary attraction of the area, pounced on the opportunity. 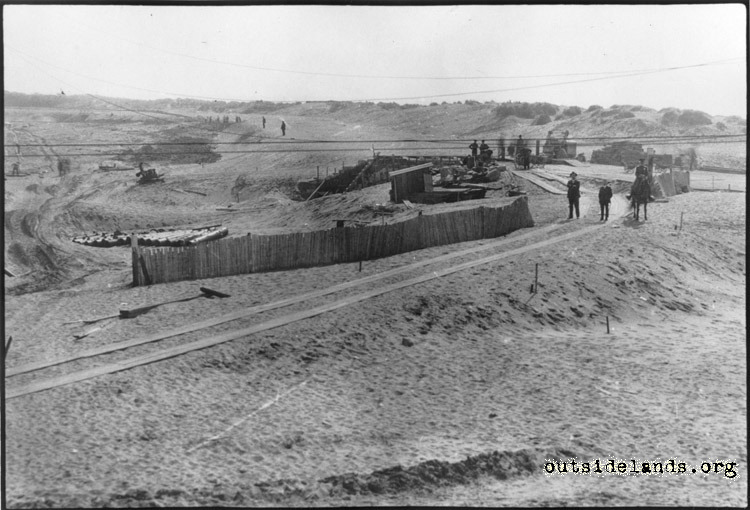 With an almost disturbing zeal, it began a campaign to bury the pool and expand over the land. 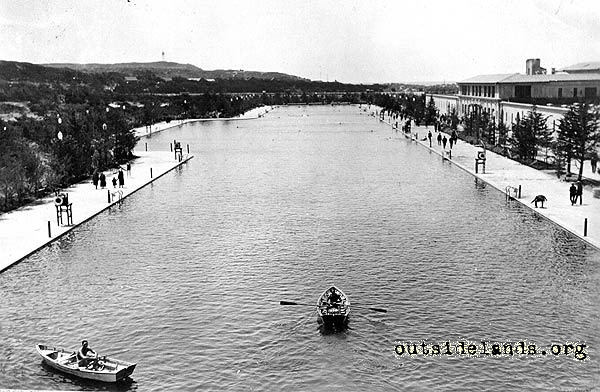 Zoo director Saul L. Kitchener wanted the city to face facts: "While there is no doubt the pool was an audacious project when it was built in 1924, its day has passed." What great plans did the zoo have for the grounds? A majority of the land it earmarked for a parking lot. 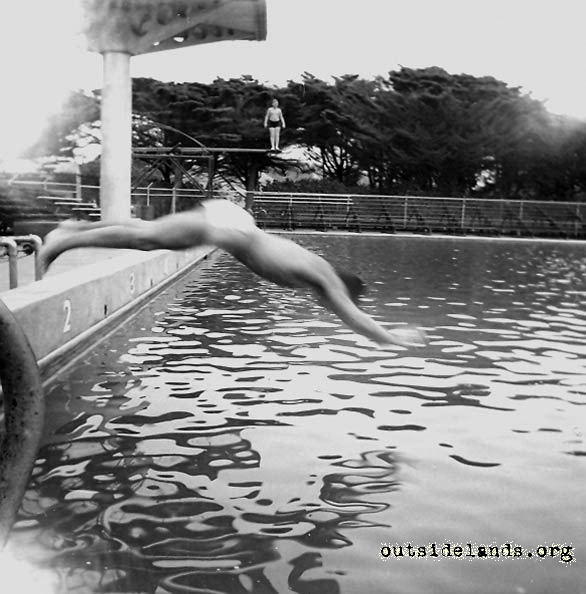 A resistance movement began, and a measure to save the pool appeared on the ballot in 1977. San Francisco voters couldn't swallow paying the million dollars proposed to restore the pool and voted it down. In 1981, bulldozers began pushing debris into the drained pit. Forty years after Fleishhacker Pool closed, the zoo has its parking lot. A sewage line passes through the land, and instead of a recreation site, the city has a water treatment plant at the ocean's edge. Acting somewhat as a grave marker, the 450-foot long bathhouse still stands. Every year or so the Zoo clears out the homeless that encamp inside. Some preservationists and neighbors want the bathhouse to be repaired for a community recreation center and restaurant. The Zoo and City of San Francisco couldn't think that big when the economy was booming. Maybe it was easier to think big in the 1920s. The world's largest pool and its bathhouse were conceived and created in just three years. 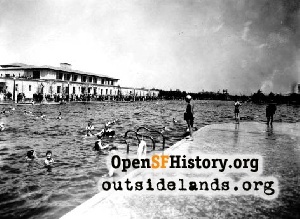 The recently constructed Charlie Sava public pool on 19th Avenue and Wawona Street took over a decade. 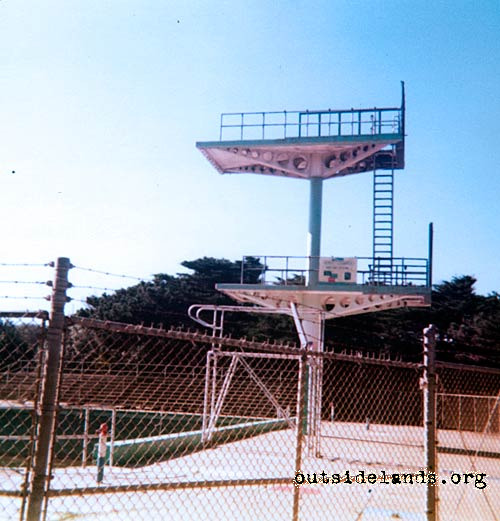 One of the most vocal supporters of Fleishhacker Pool in its last days was an old lifeguard named Billy Nichols. He had once asked Herbert Fleishhacker why he built such a big pool. Fleishhacker told him to swim the entire length and back. When the lifeguard returned Fleishhacker asked, "Did anyone get in your way?" Nichols answered no. "That's why I did it." Bibliography: San Francisco Examiner-Chronicle, Aug 29, 1976; Good Life in Hard Times, Jerry Flamm, 1978; San Francisco, A Guide to the Bay and its Cities, 1940. 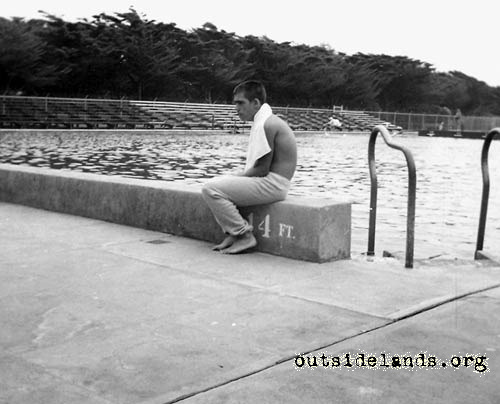 Swimmer at Fleishhacker Pool, 1960s? Page launched 24 February 2001; updated 22 December 2010.